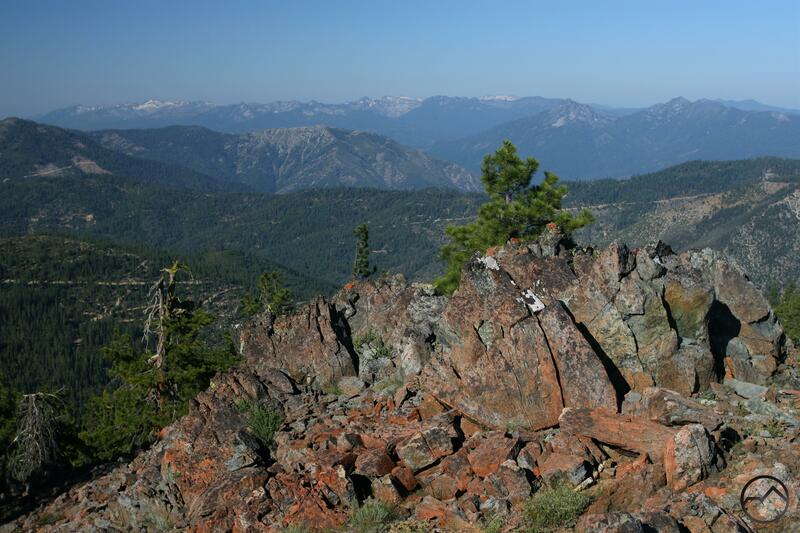 A quick off trail scramble to views into the heart of the Klamath Mountains especially of the magnificent Trinity Alps. South Mumbo Peak from the north side of Mumbo Basin. South Mumbo Peak is one of the westernmost mountains in the Trinity Divide. Only the massive Bonanza King is further to the west. Indeed, South Mumbo Peak is one of the few peaks that actually lie on the west side of the Divide crest. The peak, unofficially unnamed, is little known and rarely climbed, being generally overshadowed by nearby peaks that are higher, boast lakes on their flanks, and are closer (albeit by short distances) to the communities around Mount Shasta. Nonetheless, the peak makes for a quick and worthy outing while driving the South Fork-Castle Creek Loop, one of the paved roads that penetrate the Trinity Divide’s high country. A short scramble yields great views of Mount Shasta, Mount Eddy and the Grey Rocks as well as a rare opportunity to view the western side of the Trinity Divide, a mountain range that is almost exclusively viewed from the east (the great exception to this is the view of the Divide from the rarely climbed peaks on the eastern fringe of the Trinity Alps), as well as a grand view of the Trinity Alps. The peak is one of the easier peaks to summit in the Trinity Divide. This alone, plus the relative ease of access, makes the South Mumbo Scramble a hike that deserves more attention than it currently receives. 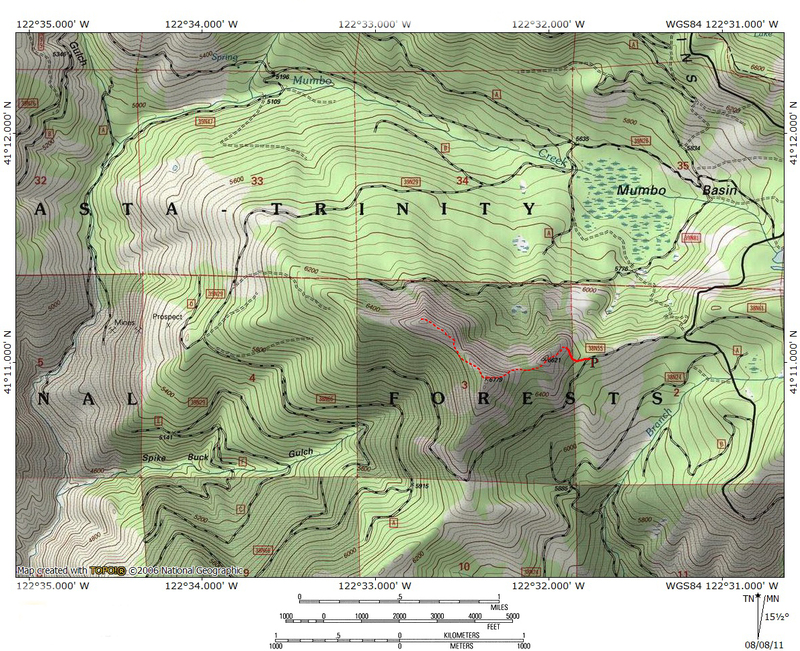 The Trinity Divide is a north to south trending range that stretches 20 miles from China Mountain in the north to Red Mountain in the south. The range is so named because it constitutes the divide between the Trinity River and Sacramento River watersheds. 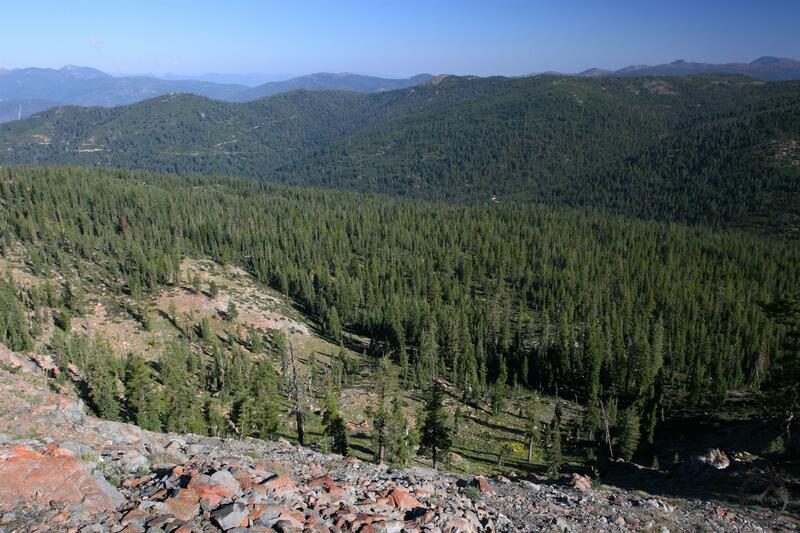 A small section at the northeast end of the divide, north of Mount Eddy contributes waters to the Shasta River. Most of the peaks in the range are found along the crest or on the massive rib that extends east from the center of the Divide and culminates in the magnificent Castle Crags. Only a handful of peaks are found on the west side of the Divide. South Mumbo Peak is one of these few summits. Consequently, it is entirely within the Trinity River watershed. One of the largest, early tributaries of the Trinity River, Mumbo Creek, forms on the north side of the mountain. The peak is the southern verge of Mumbo Basin, a large, forested bowl that has extensive meadows. The Mumbo Lakes are at the head of the basin, just east of South Mumbo Peak. Mumbo Peak composes the northern boundary of Mumbo Basin. Rocky face of South Mumbo Peak. 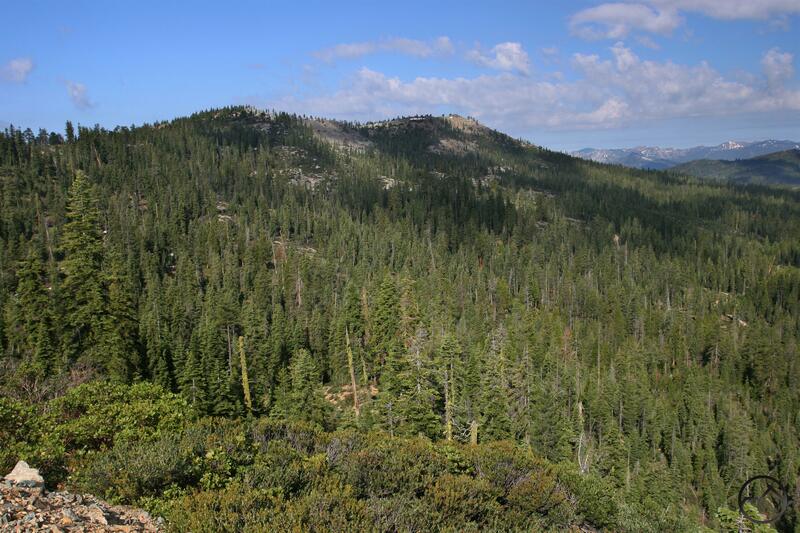 Like much of the Trinity Divide, South Mumbo Peak is composed primarily of serpentine, a greenish-blue rock (the state mineral of California) that is the raw form of asbestos. Peridotite, greenstone, and granitic rocks are found along the crest of the mountain. Like most of the peaks in the Trinity Divide, South Mumbo Peak has forested southern slopes and a craggy northern aspect. Though not as rugged as many of the other peaks in the Divide, the bare rock face of South Mumbo maintains an attractive appearance. There appear to be two glacial cirques carved into the northern face, complete with what seem to be small moraines. Though unconfirmed, this conforms to the general pattern of peaks in the Trinity Divide, which generally have forested southern slopes, craggy northern faces that preside over glacial lake basins. South Mumbo Peak even has a small pond in place of a lake in the larger cirque. Despite not having significant lakes, both cirques still boast attractive meadows that are filled with large fields of yellow lupines. Mount Shasta from the observation site. From the pullout on road 38N55, there is an obvious route up the side of the mountain. The route is not a maintained path but a very faint use trail. There is a fair amount of short, innocuous brush covering the ground through which the path is discernible. As one progresses, the path gets narrower and ultimately fades as it leaves the forest. 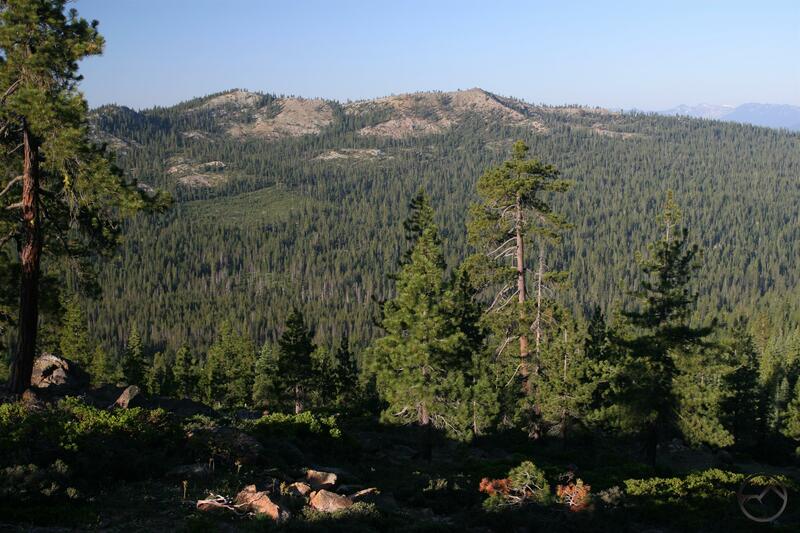 From here, the slopes are generally naked rock with patches of low brush. It is easy to pick ones way through the brush to the rocky shoulder of South Mumbo Peak. This shoulder is used as the volcano observation point. The path to this point was probably established by those who placed a USGS volcano monitoring station at the east end of South Mumbo Mountain. 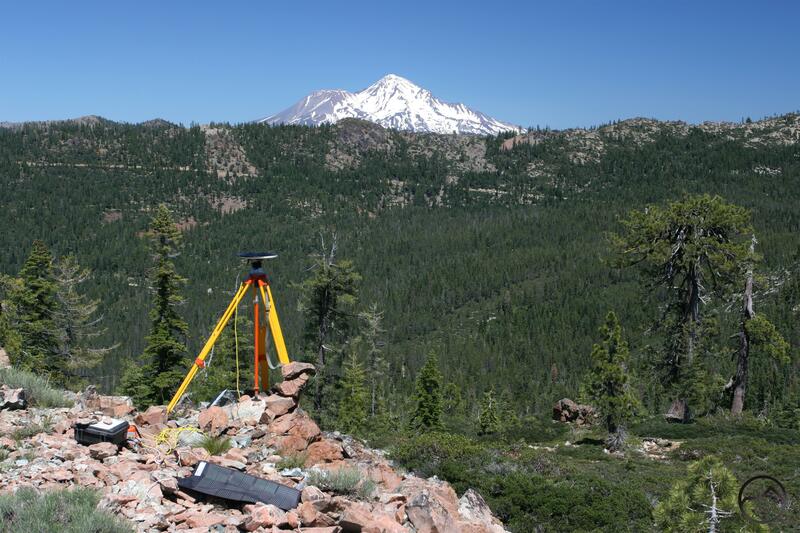 The location is opportune, since Mount Shasta towers high above the Trinity Divide crest to the east. The monitoring station is not always present but if it is do not disturb it. A cirque meadow and Mumbo Basin viewed from the summit. From the shoulder, continue west to the edge of a saddle that separates the shoulder from the summit. The route is essentially trailless from this point on but is easy to follow. Simply maintain a course along the top of the ridge as it heads west, passing some patches of brush and large boulders. Eventually the ridge begins to drop down into a saddle separating the part of the ridge hosting the observation point and the summit of South Mumbo Peak. To reach the summit, one simply heads descends into the saddle and makes the short, steep climb up to the summit of South Mumbo Peak. Although it is the highest point on the mountain, the views from the summit are not the best that can be had in the area. The summit itself lacks a thick forest canopy but there are enough trees just below the top of the peak that the views are partially obscured. Below the summit, the meadow filled cirques are visible 700 below. Seldom visited, they are quite inviting from this perspective. 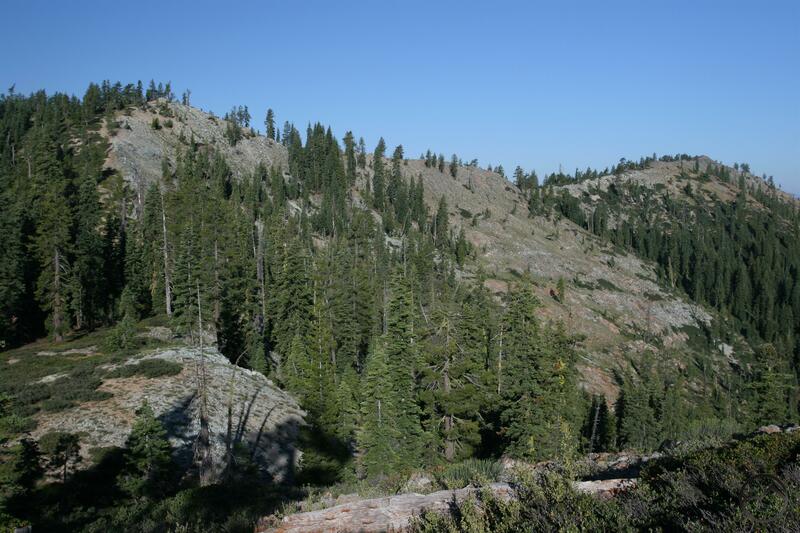 The craggy peaks of the Trinity Alps. For a better vista, continue north from the summit. The route drops down another slope to a ridgeline that leads to the north shoulder of South Mumbo Peak, which is a much better vantage point. The ridge traverse is the most attractive part of the trip, with great views in all directions, wildflowers and pleasant hiking. Eventually the ridge ends at a rocky outcrop that lacks significant tree cover. From here the Scott Mountains, the northern Trinity Divide including Mount Eddy, Mount Shasta, the southern half of the Trinity Divide and Bonanza King are all part of the viewshed from the north shoulder of South Mumbo Peak. Perhaps the most impressive view, though, is to the west, where the Trinity Alps loom darkly, only 8 miles to the west, across the Trinity River’s upper canyon. Rank upon rank of dark, jagged peaks spread out into the western horizon. From the shoulder, simply retrace ones steps. A shortcut back to the parking area heads southeast from the saddle between the summit and volcano observation point. The terrain through this stretch is generally open, but does require a small amount of bushwhacking. Many Lakes Mountain above Mumbo Lake. Though not on the trail, it is worth mentioning the nearby Mumbo Lakes. These lakes are easily accessed off of the paved Forest Service road the loops around the southern end of the Trinity Divide. Mumbo Lake is a large tree lined lake at the foot of Many Lakes Mountain and Tri-Counties Peak. The Pacific Crest Trail passes high above the lake. 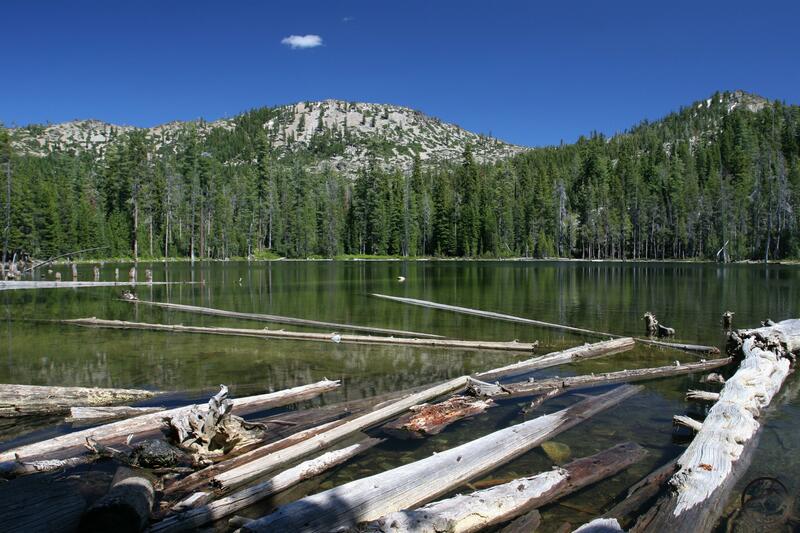 Though not significant trails pass by the lake, it is a great place for dispersed camping and there is plenty of opportunity for some cross-country exploration, especially to shallow Upper Mumbo Lake and some unnamed ponds and meadows. Interestingly, the lake is one of the few in the northern two-thirds of the Trinity Divide that lies on the west side of the crest. Only Picayune Lake the Deadfall Lakes share the western side of the range. Conversely, in the southern end of the range, the lakes are almost exclusively on the west side, Grey Rock Lake and some extremely remote tarns being the lone exceptions. If hiking the South Mumbo Scramble, Mumbo Lake is worth a stop. South Mumbo Peak viewed from the approach near Gumboot Saddle. From the town of Mt. Shasta, head west on W. Lake, crossing over I-5. At the stop sign, turn left onto Old Stage Road. After 0.25 miles, veer right onto WA Barr Road. Continue south, crossing over the dam that impounds the Sacramento River and forms Lake Siskiyou. At the intersection with Castle Lake Road, stay straight. The road becomes Forest Road 26. Follow this road for nearly 12 miles. A signed fork indicates Gumboot Lake is 0.5 miles to the left. Continue to the right, climbing up the cirque that contains the Gumboot Lakes. The PCT Gumboot Trailhead is located at the summit. From the Gumboot Trailhead, continue driving for another 2.3 miles to the intersection with road 38N55. Head west on this dirt road for 0.5 miles to a wide section with an obvious use-trail heading off the south.